Episcopal Diocese of Texas 2018 Council was held in Waco February 15-17. St. Stephen's delegation was Carvel Glenn, James Ozga, Gary Patterson, Laura Thewalt and Rev. Lisa Hunt. Thursday's highlights included the opening Eucharist at First Baptist Waco with the Rt. Rev. Jane Alexander, Bishop of Edmonton preaching. Following the worship service we celebrated 40 years of women's ordination in the Diocese of Texas with a video presentation as well as several women clergy of the diocese sharing their experiences in ministry. 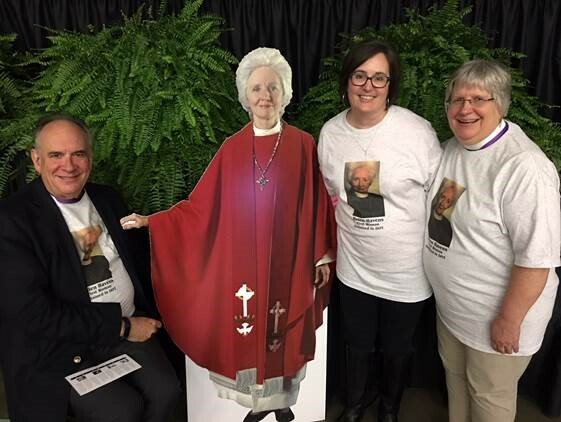 St. Stephen's represented by wearing t-shirts with Helen's photo on them. Friday began the business of council starting with bible study and plenary sessions which included speakers from Project Curate (kyo͝oˈrāt) Matthew, Secunda and Brandi sharing authentically how they are working on social justice and racial reconciliation in the fifth ward of Houston, encouraging the attendees of council to look for way to practice the same in our own communities and neighborhoods. Saturday elections for Standing Committee, Executive Board and other bodies were held. Also, a presentation about the search and call process for the next Bishop Suffragan of the West region featuring artwork by committee member and St. Stephen's own Carvel Glenn. Also on Saturday, Council took up the approval of the Diocesan budget where our Rector, Rev. Lisa Hunt spoke about the culture shift in the Diocese to being a well-resourced Diocese as it relates to the compensation of the top-paid Diocesan staff against the backdrop of all clergy compensation. The amendment Council voted on was to cap the highest paid Diocesan staff at 5% with the difference being reallocated to Rural and Hispanic ministries. There was a vote by tellers and the margin of defeat of the resolution was 75 votes, illustrating the issue resonated with many at Council. The Bishop's address largely focussed on the matter of vocations in the future of the Diocese. The Diocese of Texas Council report is also on the EDOT website. Gary Patterson, "Helen Havens", Laura Thewalt, Lisa Hunt. Missing: Carvel Glenn and James Ozga.